The list of gymnasts, who are assigned to compete at the 34th Memorial Arthur Gander, has been released. Romania's Catalina Ponor and compatriot Marian Dragalescu will perform at the competition. Both gymnasts had a disappointing competition at the last World championships where Romania left with no medals. Daria Spiridonova, whose last major competition was the Rio Olympic Games, will take part at the meet. The competition will feature Olympic and World bronze medalist Giulia Steingruber of Switzerland and the recently crowned World beam champion Pauline Schafer of Germany. Women's competition: Ilaria Kaeslin (SUI), Marine Boyer (FRA), Angelina Radivilova (UKR), Isabela Onyshko (CAN), Charlie Fellows (GBR), Marcia Vidiaux (CUB) and Hitomi Hatakeda (JPN). Men's competition: Pablo Braegger (SUI), Eddy Yusof (SUI), Marcel Nguyen (GER), Zacheri Hrimeche (FRA), Marian Dragalescu (ROU), Oleg Verniaiev (UKR), Igor Radivilov (UKR), Nikolai Kuksenkov (RUS), Zachary Clay (CAN), Gianni Regini-Moran (GBR), Manrique Larduet (CUB) and Wataru Tanigawa (JPN). The Memorial Arthur Gander will be held on November 1st in Switzerland. Female gymnasts choose three apparatus while male gymnasts choose four to compete on. Last year, Russia's Angelina Melnikova and Ukraine's Oleg Vernyayev. Canada won two gold medals out of four in the event finals, with Brittany Rogers on vault and Ellie Black on beam. 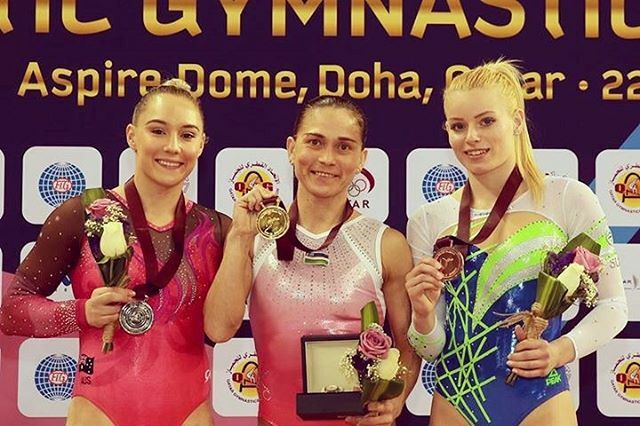 The bars title was won by Russia’s world champion Daria Spiridonova, while floor went to Romania’s Universiade all around champion Larisa Iordache. The vault title went to Canada’s Olympian Brittany Rogers with an overall score of 14.250. The former Georgia Gymdog scored a 14.500/5.4 for her DTY and a 14.000/5.2 for her Yurchenko half-in half-out. Second was Liliia Akhaimova of Russia with a 13.983. Akhaimova impressed once again with a very well executed DTY for a 14.300/5.4, but her low difficulty on her second vault (13.666/4.6) kept her behind Rogers, despite a higher execution score. Akhaimova was the only gymnast in the competition to score over 9 in execution on both vaults. Russia’s world champion and Olympic medallist Maria Paseka was only third with a 13.916, after messing up her Amanar vault, and landing both her vaults out of bounds. She scored a 13.900/5.8 for her Amanar and a 13.933/5.2 for her Yurchenko half-in half-out. World champion Daria Spiridonova of Russia won gold on the uneven bars with a 14.233/5.7. Spiridonova has not regained either the form or the difficulty she had last year, but her strong performance at the Universiade may make a case for having her on the World championships team. Second was eternal Kim Bui of Germany, who, at 28, scored an impressive 14.066. With a 5.8 Bui also had the highest D-score of the competition. Third was Canada’s Ellie Black, who redeemed herself after a poor performance on bars in the all around, with a good 13.966/5.7. Ellie Black also won the balance beam title with a good 14.133/5.8. Black impressed with her difficulty and consistency, the only evident wobble being after her double spin. Second was Japan’s Natsumi Sasada, who performed a lovely and poised routine for a 13.833/5.6. Third was Romania’s Larisa Iordache, who had the highest difficulty in the field, a 6.1, but fell once again on her layout full twist for a 13.666/6.1. Iordache showed plenty of difficulty and potential at these championships, but fell off beam three times out of three, which will leave her (and us) wonder whether having two full twists in one routine is really worth the risk. Larisa Iordache then redeemed herself, winning gold on floor with a 13.800/5.4. Her routine was weird, however, as she missed her second tumbling pass, and had to improvise the following two. In her second pass, she was supposed to compete a two-and-a-half twist into punch front, but did not get enough rotation, and ended up landing only an over-rotated double twist. She then attempted the same pass again, successfully, on her third pass, and ended her routine with a triple twist, instead of the normal double pike. We must praise her quick thinking, but hopefully it will not happen again, especially not at Worlds! Second was Japan’s Asuka Teramoto with a 13.766/5.4. Third was Liliia Akhaimova, who competed a very difficult routine, which included a double Arabian to punch front and a double layout, for a 13.533/5.6. The 2017 Summer Universiade was held from August 19 to August 29 in Taipei City, Taiwan. Larisa Iordache of Romania proved that she is officially back as an all arounder, winning the all around title with a 56.750. 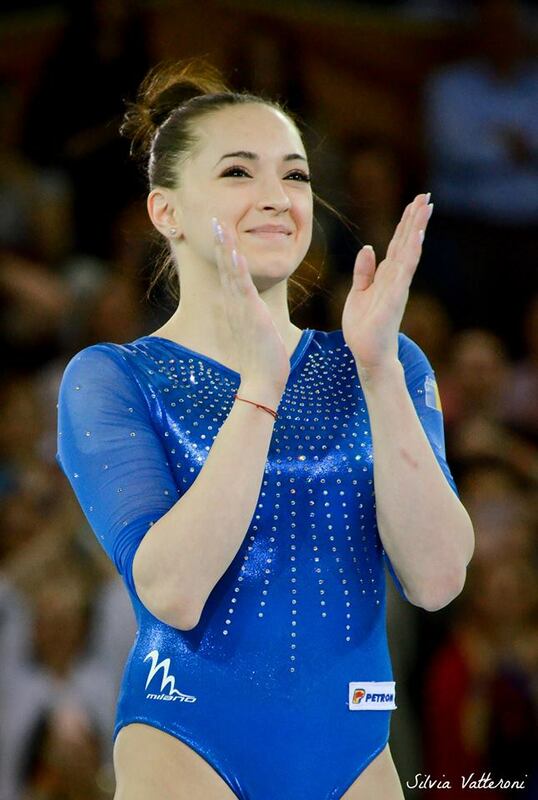 Iordache had a steady performance, scoring a 14.400 on vault, a 14.300 on bars, a 14.00 (with a fall!) on beam and a 14.050 on floor. She is not her cleanest self, and her leg form in particular is a bit sloppy here and there, but she is certainly a contender for multiple medals at the World championships, especially in this post-Olympic year, when no one looks entirely polished (except for the U.S. juniors!). Iordache also has the top balance beam difficulty in the world right now with a massive 6.5. She performs both a full-twisting layout (very tucked though) and a full-twisting tuck. She fell on the latter both in qualifications and in the all around competition, she will want to work on her execution for Worlds. Second was Olympian Asuka Teramoto of Japan, who keeps impressing with her consistent performances over the years. The 2017 American Cup silver medallist posted a good 55.650 all around score. She scored a 14.500 on vault, a 13.950 on bars, a 13.800 on beam and a 13.400 on floor. Third was Olympian Ellie Black of Canada with a 54.950. Black, who had qualified in first place, scored a 14.500 on vault, a 14.00 on beam and a 13.550 on floor, but had trouble on bars with a 12.900. Fourth was Evgeniya Shelgunova of Russia with a 54.200, fifth was Japan’s Natsumi Sasada with a 53.250, sixth was Filipa Martins of Portugal with a 52.400, seventh was Gabriela Janik of Poland with a 52.050 and eighth was Daria Spiridonova of Russia with a 51.700. Spiridonova, however, posted the highest score on bars, a 14.450. A couple of NCAA gymnasts competed in the all around final as well. Senior Briannah Tsang of Penn State competed there for Canada and was eleventh with a 51.000. Germany’s Pauline Tratz is committed to UCLA as a freshman for this upcoming season, and was thirteenth with a 50.350. The first day of competition also determined the team final winners. Russia won the competition with a 163.000. The Russian team was formed of Lilia Akhaimova, Daria Elizarova, Evgeniya Shelgunova and Olympians Daria Spiridonova and Maria Paseka. Paseka made a strong case for herself for a spot on the World championships team, after hitting her Amanar for a 15.000. Akhaimova impressed on vault, where she competed a solid DTY for a 14.450 and on floor, where she scored a 13.600. Elizarova, who is 26, also impressed on floor with a beautiful and difficult routine, and qualified in first place for the final with a 13.850. Both Elizarova and Akhaimova performed a double Arabian to punch front as their first tumbling pass. Second in the team final was Canada with a 161.100. The team was formed of Olympians Ellie Black and Brittany Rogers, Jessica Dowling, Denelle Pedrick and Briannah Tsang. Canada was surprisingly the best team on balance beam, but struggled with difficulty on floor and with consistency on bars. In addition to Tsang, Denelle Pedrick is also an NCAA gymnast at Eastern Michigan, and Brittany Rogers is a former Georgia Gymdog. Third was Japan with a 159.900. The team was formed of Yumika Nakamura, Natsumi Sasada, Ayana Tone, and Olympians Yuki Uchiyama and Asuka Teramoto. Nakamura and Uchiyama both posted big scores on the uneven bars. Fourth was Germany (which included NCAA gymnast Antonia Alicke of UIC and Olympian Kim Bui), fifth the Netherlands, sixth Chinese Taipei, seventh Portugal and eighth South Korea. Gymnastics at the European Youth Olympic Festival (EYOF) was held at the new Radnóti Street Sports Park in Győr, Hungary on 26-29 July 2017. Female gymnasts born in 2002 and 2003 were allowed to compete. The EYOF is a the biennial multi-sport competition founded in 1991, which gives Europe's top junior athletes a chance to compete in a continental event. This year's event’s slogan is ‘One spirit, whole Europe!’ It features 3,500 athletes from fifty nations competing in ten sports: artistic gymnastics, athletics, basketball, cycling, canoe/kayak sprint, handball, judo, swimming, tennis and volleyball. The team competition was won by Russia for the third consecutive time with a total score of 107.700. The team was formed of Russia’s junior champion Ksenia Klimenko, Valeria Saifulina and Varvara Zubova. The trio overcame a low-score rotation on bars (26.850), where they had to count Saifulina’s 11.650, to rally back on vault (27.250), floor (26.450) and particularly beam (27.150). On vault, Saifulina redeemed herself, posting a 14.000. On floor, Klimenko posted a 13.250 and Zubova a 13.200. And on beam, Klimenko scored a 13.950 and Saifulina a 13.200. Second was Italy with a 106.500. The Italian team was formed of Elisa Iorio and twins Asia and Alice D’Amato. The Italians posted the highest combined score by any team at these championships, an outstanding 28.150 on vault, which was capped by Asia D’Amato’s beautiful DTY (14.450). Italy also had a good rotation on bars, with Asia D’Amato posting a 13.700 and sister Alice a 13.550. Italy struggled a bit on beam and floor, where they scored a 25.650 and a 25.450 respectively. The highest score on beam and Asia D’Amato’s 13.050, while on floor Elisa Iorio posted a 12.800. Third was Germany with a 104.950. The German team was formed of Leonie Papke, Emelie Petz and Kim Ruoff. Germany’s best apparatus score came on vault with a 27.550, where Petz scred a 14.000. On bars they posted a 26.500, on beam a 25.500 and on floor a 26.250. Emelie Petz posted the best score on all other three apparatuses as well, a 13.200 on bars, a 13.100 on beam and a 13.350 on floor. Fourth was Hungary with a 103.600, fifth was Great Britain with 103.150, sixth France with 102.400, seventh the Netherlands with 101.050 and eighth Switzerland with 100.850. Russia’s Ksenia Klimenko won the all around title with a 54.450. Klimenko’s best score came on bars (14.150/5.8). She then posted a 14.050/5.8 on beam, a 13.300/4.6 on vault and a 12.950/4.9 on floor. Second was a delighted Asia D’Amato from Italy with a 53.750. D’Amato landed another beautiful DTY for a 14.500/5.4, as well as a 13.400/5.3 on bars, a 13.300/5.2 on beam and a 12.550/5.0 on floor. Third was Russia’s Varvara Zubova with a 52.850. Zubova’s highest score came on her best apparatus, beam, with a 14.050/5.9. She also scored a 13.300/4.6 on vault, a 13.100/5.1 on bars and a 12.400/4.9 on floor. Fourth was Italy’s Elisa Iorio (52.600), sixth was Great Britain’s Taeja James (52.500), sixth France’s Célia Serber (51.650), seventh Great Britain’s Amelie Morgan (51.550) and eighth Hungary’s Nóra Fehér (51.400). Russia dominated the event finals, winning three finals out of four and a total of four medals. Vault was won by Russia’s Valeria Saifulina with a combined score of 14.149. Saifulina scored a 14.033/5.0 for her first vault and a 14.266/5.4 for her second one. Second was Romania’s Denisa Golgotă with a 14.033. She scored an excellent 14.400/5.4 for her DTY and a 13.666/4.8 for her second vault. Third was Italy’s Asia D’Amato with a 14.016. She scored a 14.066/5.4 for her DTY and a 13.966/5.2 for her second vault. 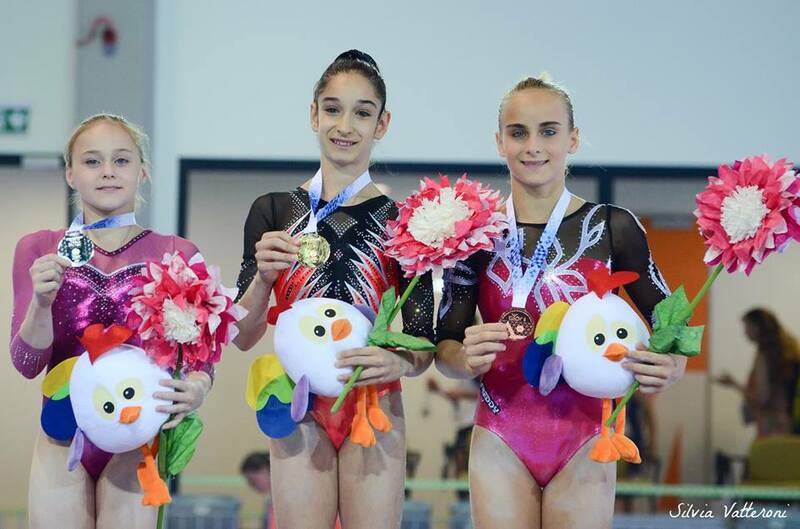 The uneven bars title was won by Italy’s Elisa Iorio (14.100/6.0), who impressed with her difficulty and clean execution. Second was Russia’s Ksenia Klimenko with a 14.066/5.8. Third was Italy’s Asia D’Amato with a 13.333/5.5. Balance beam was dominated by Russia’s Ksenia Klimenko, who posted a 13.866/5.8. Second was Italy’s Asia D’Amato with a 13.266/5.1 and third Great Britain’s Amelie Morgan (13.233/5.1). Ksenia Klimenko also won the floor title for Russia with a 13.266/5.0. Second was Germany’s Emelie Petz (13.133/4.9) and third France’s Célia Serber (12.866/4.7). The 2017 Jesolo Trophy was held on 1 and 2 April in Jesolo, Italy. The United States dominated the competition, showing off two teams with great depth and margin of improvement. Impressive performances were also put up by Brazil, which gained a gold and three silver medals, Russia, which earned a gold and three bronze medals, and Canada, which earned a gold medal. 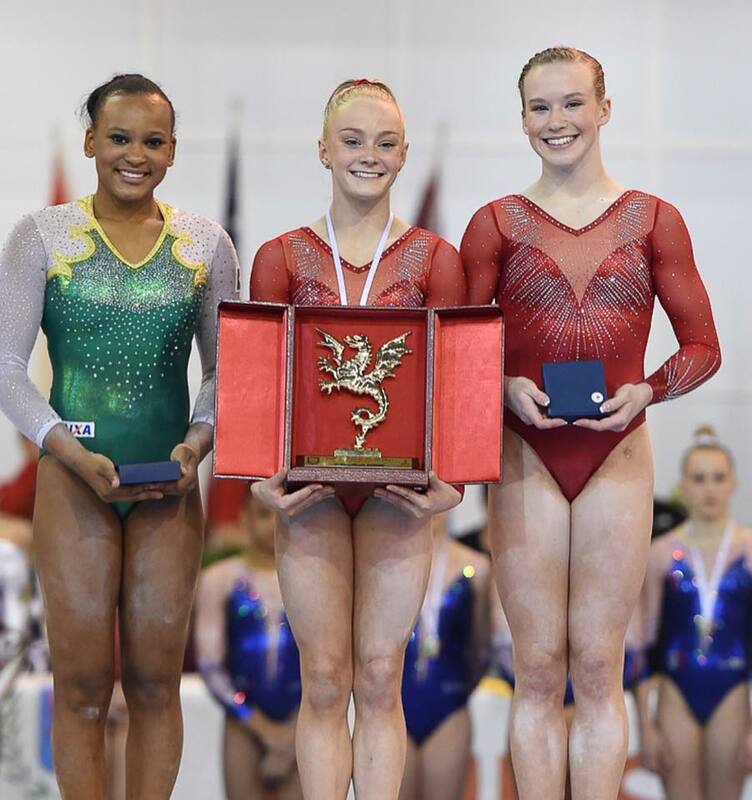 The senior team competition was won by the U.S. team formed of Riley McCusker, Morgan Hurd, Victoria Nguyen and Ashton Locklear with a score of 167.950. Second was Brazil, composed of Olympians Rebeca Andrade, Flavia Saraiva and Carolyne Pedro and Thais Fidelis with a score of 164.650. Third was Russia, whose team was formed of Olympians Angelina Melnikova and Daria Spiridonova and rising stars Elena Eremina and Natalia Kapitonova, with a score of 164.600. The USA also competed with a second team formed of Abby Paulson, Trinity Thomas and Yelena Shchennikova, who were all competing internationally for the first time. Paulson had an amazing competition, while Thomas and Shchennikova struggled a little, but have big margin of improvement. U.S. Riley McCusker got redemption after the American Cup, winning the all around title in her second international competition with a big score of 56.600, despite a fall on floor. McCusker’s top score came on bars, where she posted a huge 15.050/6.2. She also scored an excellent 14.600/5.4 on vault 14.200/5.5 on beam and 12.750/5.2 on floor. Second was Brazilian Olympic finalist Rebeca Andrade, who scored a 56.000. Andrade’s top score was a big 15.000/5.4 on vault. She also scored a 13.800/5.3 on bars, a 13.550/5.4 on beam and a 13.650/5.0 on floor. Third was U.S. Abby Paulson, a huge result on her international debut (55.800). Paulson scored a 13.700/4.6 on vault, 14.300/5.6 on bars, a 14.200/5.8 on beam and a 13.600/5.4 on floor. Fourth was Russia’s Elena Eremina (55.750), who scored a big 14.850 on bars, fifth was Brazil’s Flavia Saraiva (55.400), who had an uncharacteristic fall on beam and sixth was Russia’a Angelina Melnikova (54.800). US Ashton Locklear, in her first competition since the 2016 Olympic Trials, posted two excellent scores on bars (14.750/5.5) and beam (14.000/5.6). The event finals revealed some fantastic gymnastics. Vault was won by Canada’s Shallon Olsen with a big 14.500 (14.650 and 14.350). Second was Italy’s Sofia Busato with a 14.175 (14.400 and 13.950) and third was Russia’s Angelina Melnikova (14.025), who finally unveiled a strong second vault (14.450 and 13.600). The uneven bars title was won by Russia’s Elena Eremina with a big 14.750/6.0. Eremina topped U.S. Riley McCusker (14.600/6.0) and Ashton Locklear (14.550/5.5). Locklear did not have the highest difficulty, but showed off her usual beautiful lines, scoring an outstanding 9.050 in execution. U.S. Riley McCusker also won the beam title with a 14.200/5.5. Tying for silver were Brazilian beam queen Flavia Saraiva (14.100/5.8) and France’s European silver medallist Marine Boyer (14.100/5.8). U.S. Abby Paulson and Brazil’s Flavia Saraiva tied for first place on floor with two 13.900s (5.4 D-score for Paulson and 5.1 for Saraiva). Third was Russia’s Angelina Melnikova with a 13.800/5.4. Melnikova is starting mastering her new difficult routine and impressed with a superb choreography. The 2017 Doha World Cup was held in Doha, Qatar, from 22 to 25 March. The Chinese women dominated the field, winning three event finals – bars, beam and floor – out of possible four. China’s Luo Huan shined on the uneven bars, in an otherwise disappointing competition. The Chinese gymnast scored a big 14.433/6.0 for a routine full of intricate pirouettes in combination. Behind her, Hungary’s Zsofia Kovacs won silver with a fall, scoring a 13.066/5.6 for a well executed routine until she fell on her full-in dismount. Third was Australia’s Georgia-Rose Brown with a 13.033/5.3 for a difficult routine that still needs some polishing. Unfortunately, China’s Liu Tingting suffered a fall in an otherwise gorgeous routine, and finished just outside the medals, scoring a 13.000/5.8. Liu Tingting found redemption in the second day of competition, winning both beam and floor. On beam, she scored a big 14.466/6.1 for a well-executed routine, packed with difficulty and unusual elements – finally some diversity! Behind her, Romania’s Catalina Ponor scored a 13.900/5.8. Ponor had a big wobble on her mount, but the rest of the routine was solid as a rock. Third was China’s Luo Huan with a 13.700/5.7 for a good routine with some remediable wobbles. While on beam Liu Tingting shines for her difficulty as well as her execution, on floor she wins only because of her consistency, which is a delightful rarity these days. She scored a 13.366/4.9 for a lovely and well-executed routine. Second was Australia’s Emily Little, who is having the time of her life (13.133/5.1). 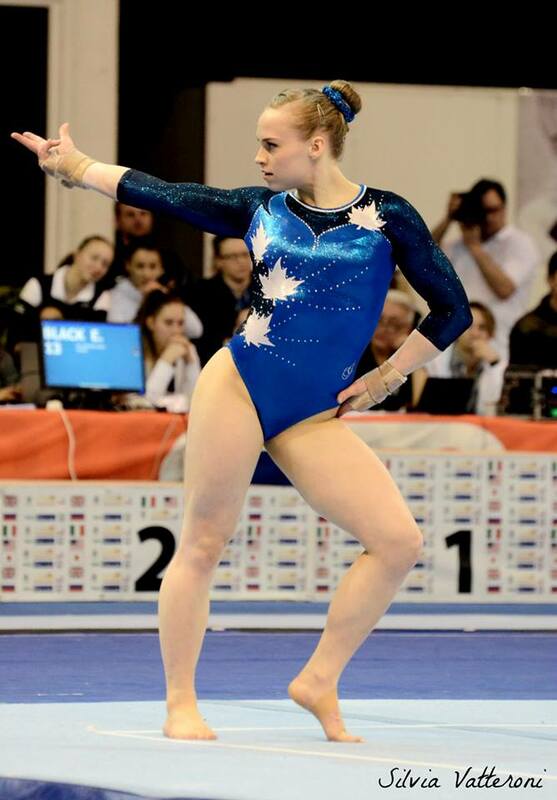 Third was Croatia’s Ana Derek with a 12.900/5.2, who was as stylish as a rhythmic gymnast. Vault was the only event the Chinese did not dominate. In fact, the qualification round was won by China’s Olympian Wang Yan with a big 14.566, but she withdrew from competition before the event final. The vault title was then won by Uzbekistan’s seven-time Olympian Oksana Chusovitina with a 14.166 (14.366/5.4 and 13.966/5.2). Second was Australia’s Emily Little with a 14.099 (14.466/5.4 and 13.733/4.8). Third was Slovenia’s Teja Belak with a 14.083 (14.166/5.4 and 14.000/5.0). Belak was the only gymnast to score both vaults in the 14.0s. The Baku World Cup was held in Baku, Azerbaijan, from 16 to 19 March. It was an event final competition only, and therefore there was no all around. The vault final was won by veteran Oksana Chusovitina from Uzbekistan, who posted an overall score of 14.333 (14.366/5.4 for her first vault and 14.300/5.2 for her second one). Second was Australia’s Emily Little, who has been having a very successful beginning of the season. Little scored a 14.067 (14.433/5.4 for her first vault and 13.700/4.8 for her second one). Third was Slovenia’s Teja Belak with a 13.750 (13.533/4.8 and 13.966/5.0). 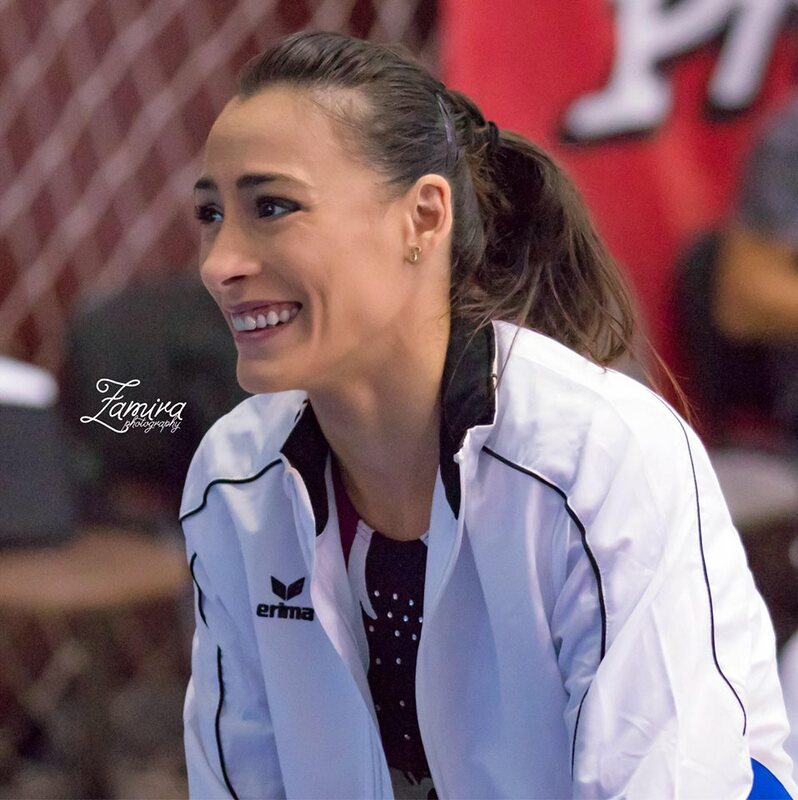 Balance beam and floor exercise were won by 2004 Olympic champion Catalina Ponor from Romania, who still seems to have a lot to give to the sport of gymnastics. Ponor won beam with a 13.833 for a solid routine. She was followed by Greece’s Vasiliki Millousi (13.633), who finally delivered a beautifully executed routine. Third was Australia’s Emily Little with a 13.433. Catalina Ponor also won floor with a 14.433, edging Australia’s Emily Little by the slightest margin – Little got indeed a 13.400 for a much cleaner routine than Ponor, which however had a lower start value. Third was Azerbaijan’s Marina Nekrasova with a 12.833. The real surprise, however, came on the uneven bars, when Ukraine’s Diana Varinska, on her international debut, won the event with an excellent 13.933. Varinska has beautiful lines and intricate combinations, and her work is reminiscent of the golden age of Ukrainian gymnastics. Second on bars was Australia’s Rianna Mizzen (13.600) and third was Australia’s Georgia-Rose Brown (13.366).